Once upon a time, I had a really bad day. A day that left me with an ache for days after. Have you ever had one of those, a day that you knew God was there, but it was still so, so hard? When you’d never been more confident in His plans, but giving over that stubborn piece of your heart got harder and harder each time you tried to lay it on the altar? The day passed. I tasted the bittersweet. Bitter–because the sacrificing only got more costly. Sweet–because I knew my Jesus would be enough even in darkness. The next days weren’t easy. A lot of prayers. A lot of tears. A lot of wobbly smiles and Mom hugs and jumbled thoughts and wondering if this cloud would ever let the sun through again. You’ve been there too–days that leave a stamp on your heart and you doubt the memories will ever really fade. And yet, God was there. But that day, once upon a time, is not what I want you to remember. Sometimes God pulls back the curtain and lets me get a peek at His masterpiece. This particular brushstroke in this painting we call history came to me in an e-mail. That day, God did something with me. With a life that felt out of control, but was never really out of His. Even when it felt dark. His grace was still amazing. And He took this little flickering candle of a life and magnified the light, and this little light shone. I didn’t know it, but a young girl was watching me on that day. And that little girl listened. She learned that my mom and I are best friends. She could see that I respected her and that I wasn’t ashamed to be not just a daughter, but a friend to my mom. It’s not that I was trying to pull myself together and put on an act. But that even when I felt like I had nothing left to give, God was faithful. Even when it took my whole soul striving to just keep moving forward, God was in the middle, still willing to use a vessel so broken. And that bad, bad day? I’m not sorry I had it. I’d do it again, in fact, if I could get that email again too. It was the mom of that little girl, and I could almost see the tears in the lady’s eyes as I heard her words. After seeing how my mom and I are such good friends, that young girl decided she wanted to be friends with her mom just like that. She hadn’t really seen another girl before that would admit to enjoying her mom. But God took my mom and I to just the right place. And, licking an ice cream cone, I got to shine. Sisters, don’t despair the black days. They aren’t wasted. Don’t mourn the days that seem to spin far out of your control. No matter how hard it gets, keep surrendering. In your pain, in your deepest weakness–this is God’s favorite place to work. You may never know what a difference you made to a life. ….Maybe God will hold back the curtain and give you just a little glimpse…. Thank you to Edward McCabe and Public Domain Pictures for today’s photo! I narrowed my eyes at a vase of faded daffodils. Faded, I say, because every petal had grown stiff and the fragrance died away and the youth seemed to pour right out of them. And then I looked more closely. The vibrant yellow still shone on the frail petals. I cradled a single stem in my hand. All the daffodils still had their heads up, embracing the light streaming through the kitchen window. In the language of flowers, a bouquet of daffodils represents joy. 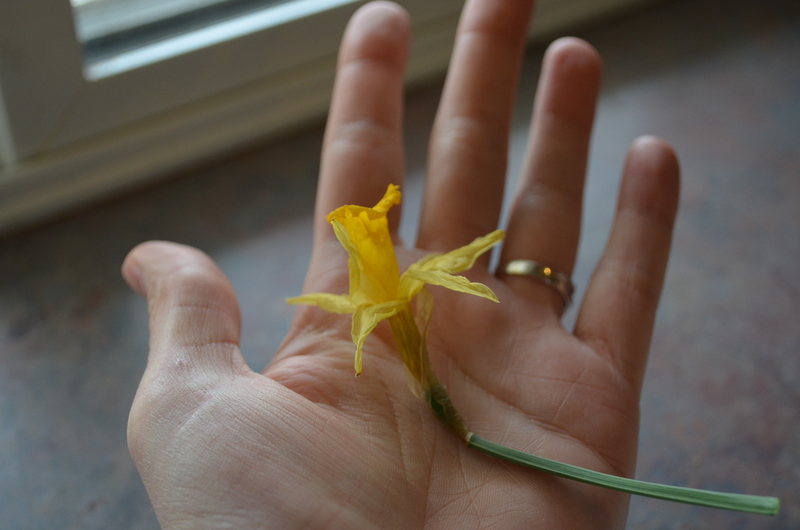 Now, maybe I’m crazy to think about the life-work of daffodils, but when I cradled that crisp happiness-flower, I thought about the joy that it brought my mom when my brother presented her with a bunch of daffodils, their golden heads bobbing in glee. Surely those plucked-up flowers were bouncing with the joy of being ripped from the soil and given away as a gift. If I dare to go on in my speculations on the personality of a daffodil, I just know that a daffodil loves to smile. How could it not smile? It pushed through half-frozen dirt and slushy ice only to pop its head out and cry, “Spring! Look!” Its canary rays stretch and its little yellow Sunday bonnet quivers in the chilly wind—a wind that can’t quite decide whether to usher in spring or prolong the winter. The daffodil stretches its thin green neck as high as it can and lifts its bright face to the sun, basking in its Creator’s glory. It stands like a lighthouse, lone and erect in the winter’s deadness. The true Light is now shining, sisters. And we “are complete in Him, who is the head of all principality and power” (Colossians 2:10). Maybe you feel the frozen ground cutting you, so you can’t find the strength to rejoice. What is the secret? Fix your gaze on the Son of righteousness. Dwell on the One who died that you might live. Remember the Savior that “ever lives and pleads” for you at God’s right hand (from the song “Before the Throne of God Above). For the darkness is past and the true light now shines (1 John 2:8). Behold the Light and dance on the hill.